SESRIC has launched the OIC Economic Outlook 2018, the flagship report of the Centre, during the 34th Ministerial Session of the COMCEC, which was held in Istanbul on 26-29 November 2018. The main highlights of the report were presented by Mr. Nabil Dabour, Assistant Director General of SESRIC, during the meeting. As is the case in every year, the OIC Economic Outlook 2018 analyses the trends in major economic indicators for OIC member countries as a group and investigates these trends in a comparative manner with their counterparts in the groups of developed and non-OIC developing countries as well as with the world average. Doing so, the report highlights a number of constraints and challenges confronting the efforts of OIC member countries towards enhancing their economic development and progress. This year’s report also includes a special part on challenges and opportunities towards achieving the OIC 2025. The OIC Programme of Action 2025 was adopted at the 13th Session of the Islamic Summit (Istanbul, 14-15 April 2016). The OIC -2025 focuses on 18 priority areas with 107 goals and vast majority of them either directly or indirectly linked with the economic development of OIC countries. According to the report, OIC countries can achieve sustainable development and strengthen their economies by exerting efforts towards realizing the goals stated in the OIC 2025. 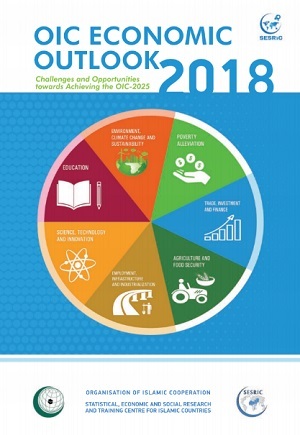 Therefore, in line with the OIC-2025, the report examines the performance of OIC MCs in the following priority areas: (i) poverty alleviation, (ii) trade, investment, and finance, (iii) employment, infrastructure and industrialization, and (iv) agriculture and food security as well as some secondary targets that are linked to achieving economic development in OIC countries such as environment, climate change, and sustainability, education, science, technology, and innovation. The report also discusses challenges and opportunities towards achieving the goals in selected priority areas. The report argues that for the implementation of the OIC 2025, it is essential to establish and strengthen cooperation between OIC countries and relevant OIC institutions. It is also vital to fully activate intra-OIC cooperation by promoting exchange of best-practices, lessons learned and success stories among OIC countries, particularly by actively engaging in existing OIC cooperation mechanisms.